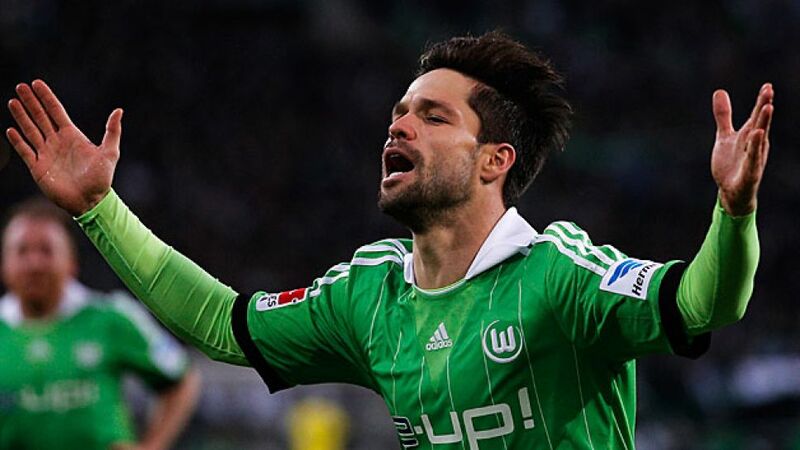 Mönchengladbach - Diego helped make it a successful conclusion to 2013 for Wolfsburg with a 2-2 draw at Borussia Mönchengladbach on Sunday. Before leaving for his holidays, the Brazilian gave bundesliga.com his views on the Wolves' fine form at the end of the year, and revealed he is determined to carry on where he left off at the Borussia Park when the Bundesliga resumes in January. Question: Diego, you took the lead, then fell behind, and then five minutes from time you rescued a point. How happy are you with this 2-2 draw against a Borussia Mönchengladbach side who are such a force at home? Diego: I'm very happy. It was a very hard game. We came here to win, of course, but a point is fine in the end because we played against a fantastic team. We can live with the result. Question: Your team appeared to be shocked after Arango's incredible goal made it 2-1. Did you believe you could still mount a comeback? Diego: I always believed it. I spoke with my team-mates and told them it was still wide open and that anything was still possible. I know we're always good for a goal, we just all had to believe until the last minute. That's why it was such a good game for us – because we tried everything. Question: Do you have anything to say about Bas Dost, who netted his first goal of the season? Diego: I'm really delighted for him. He's a great lad and a fantastic player. Like every striker, this goal is going to have done his self-confidence the world of good after such a long drought. I'm sure it'll be a boost to him. Question: You really let yourself go in your celebrations. What was going through your mind at the time? Diego: I was just happy about putting us in front. I was delighted to score a goal in such a difficult and important match, and I just let my feelings go. Question: And what kind of feeling do you go into the winter break with? Diego: I've got a very good feeling. We've done a great job. Now's the time for us to sit back and relax a little in order to come back with our batteries fully charged again, and carry on our unbeaten run in the new year. Question: Will you still be here when training resumes next year? Diego: Of course I will. I'm 100 per cent focused on VfL Wolfsburg. I'll be back in January. Question: Will a decision over your future be taken during the winter break? Diego: No, I'm waiting for the club to decide which direction they want to go in. I'm trying to show the club that I'm really happy here and really want to carry on helping the team. It's up to the club to decide really, then we can talk.